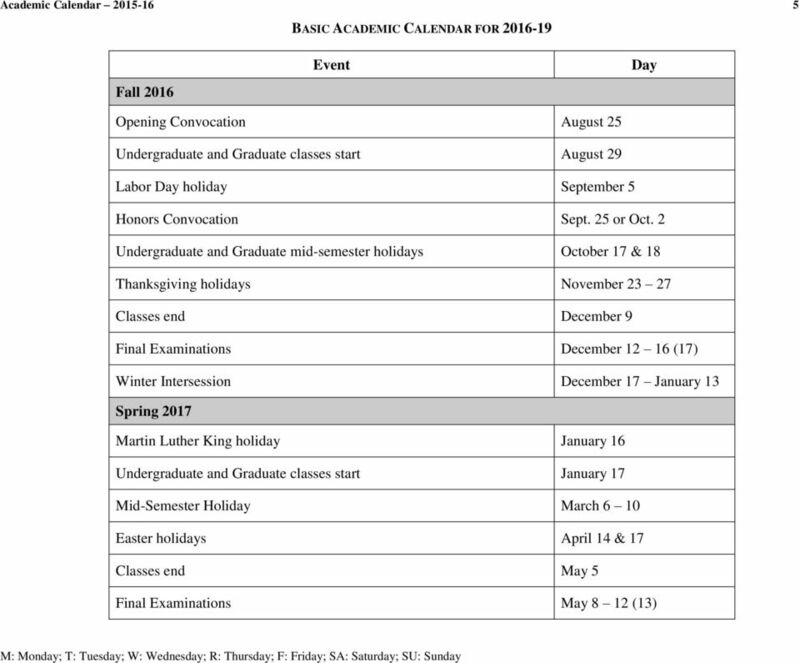 Download "LA SALLE UNIVERSITY Academic Calendar 2015-16. 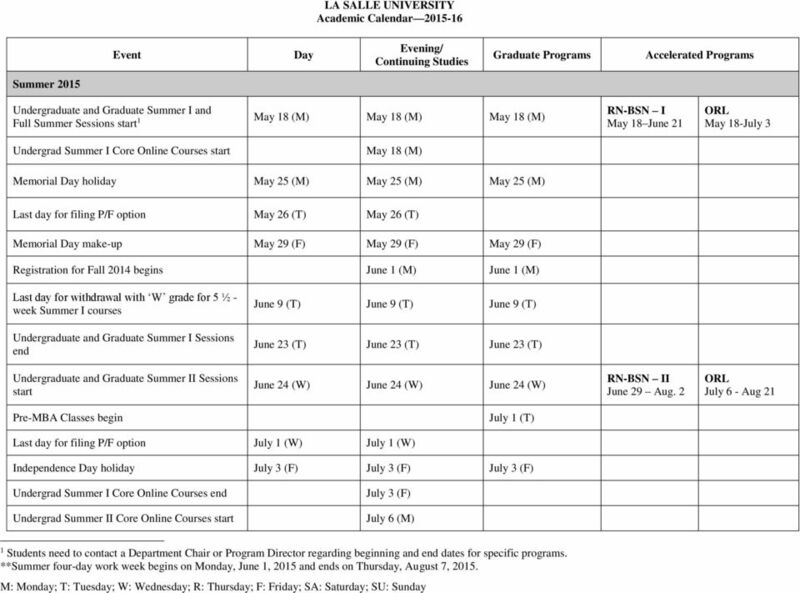 May 18 (M) May 18 (M) May 18 (M) June 9 (T) June 9 (T) June 9 (T) June 23 (T) June 23 (T) June 23 (T)"
1 LA SALLE UNIVERSITY Academic Calendar Evening/ Continuing Studies Graduate Programs Accelerated Programs Summer 2015 Undergraduate and Graduate Summer I and Full Summer Sessions start 1 May 18 (M) May 18 (M) May 18 (M) RN-BSN I May 18 June 21 May 18-July 3 Undergrad Summer I Core Online Courses start May 18 (M) Memorial holiday May 25 (M) May 25 (M) May 25 (M) Last day for filing P/F option May 26 (T) May 26 (T) Memorial make-up May 29 (F) May 29 (F) May 29 (F) Registration for Fall 2014 begins June 1 (M) June 1 (M) Last day for withdrawal with W grade for 5 ½ - week Summer I courses June 9 (T) June 9 (T) June 9 (T) Undergraduate and Graduate Summer I Sessions end June 23 (T) June 23 (T) June 23 (T) Undergraduate and Graduate Summer II Sessions start June 24 (W) June 24 (W) June 24 (W) RN-BSN II June 29 Aug. 2 July 6 - Aug 21 Pre-MBA Classes begin July 1 (T) Last day for filing P/F option July 1 (W) July 1 (W) Independence holiday July 3 (F) July 3 (F) July 3 (F) Undergrad Summer I Core Online Courses end Undergrad Summer II Core Online Courses start July 3 (F) July 6 (M) 1 Students need to contact a Department Chair or Program Director regarding beginning and end dates for specific programs. 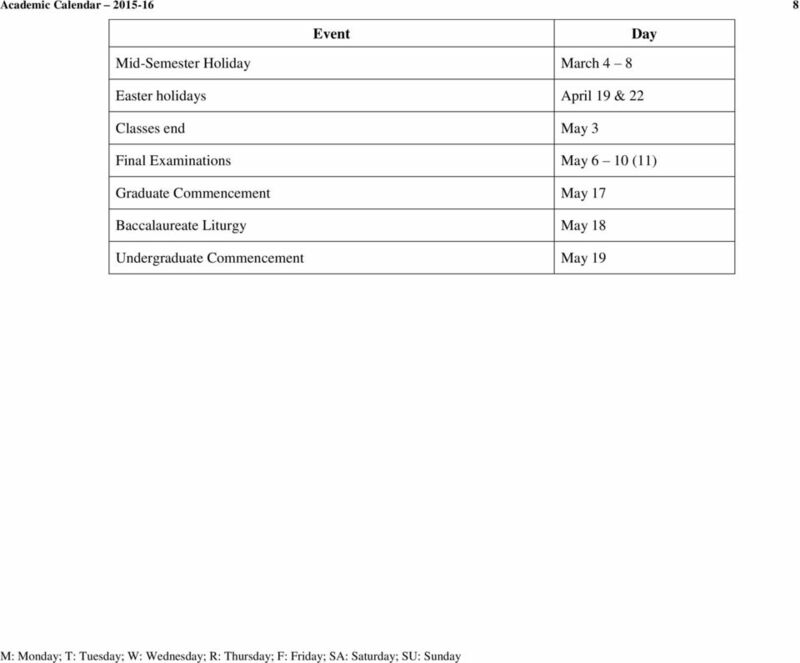 **Summer four-day work week begins on Monday, June 1, 2015 and ends on Thursday, August 7, 2015. 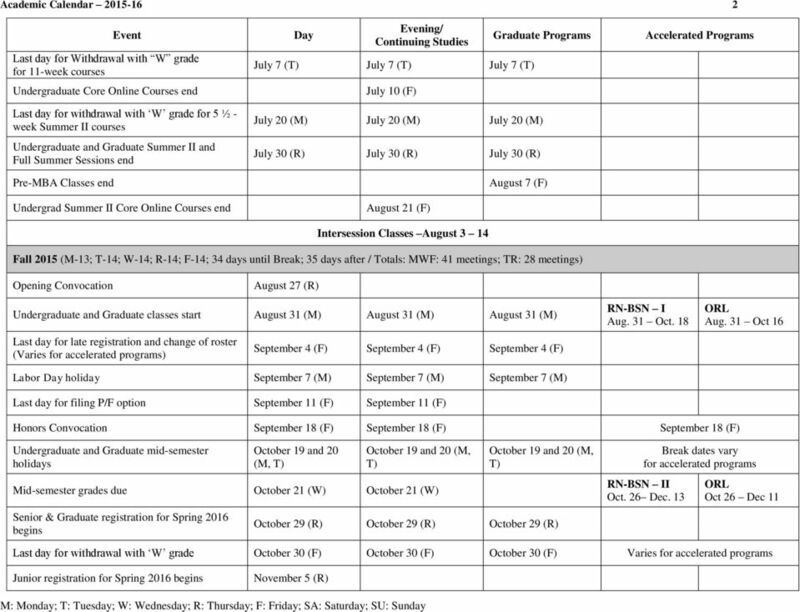 3 Academic Calendar Evening/ Continuing Studies Graduate Programs Accelerated Programs Sophomore registration for Spring 2016 begins November 12 (R) Freshman registration for Spring 2016 begins November 19 (R) Thanksgiving holidays Nov Nov Nov Classes end December 11 (F) December 12 (SA) December 12 (SA) Final Examinations Dec (M-F) Dec (M SA) Dec (M SA) End dates vary for accelerated programs Final exam dates vary for accelerated programs Supplementary Examination Date 2 December 19 (SA) December 19 (SA) December 19 (SA) Fall semester grades due December 23 3 (W) December 23 (W) December 23 (W) Dates for Intersession -- December 19 (SA) January 15 (F) 4 Spring 2016 (M-14; T-15; W-14; R-15; F-14; 34 days before Break; 38 after / Totals: MWF: 42 meetings; TR: 30 meetings) Martin Luther King holiday January 18 (M) January 18 (M) January 18 (M) Undergraduate and Graduate classes start January 19 (T) January 19 (T) January 19 (T) Last day for late registration and change of roster (Varies for accelerated programs) January 25 (M) January 25 (M) January 25 (M) RN-BSN I Jan. 19 Mar. 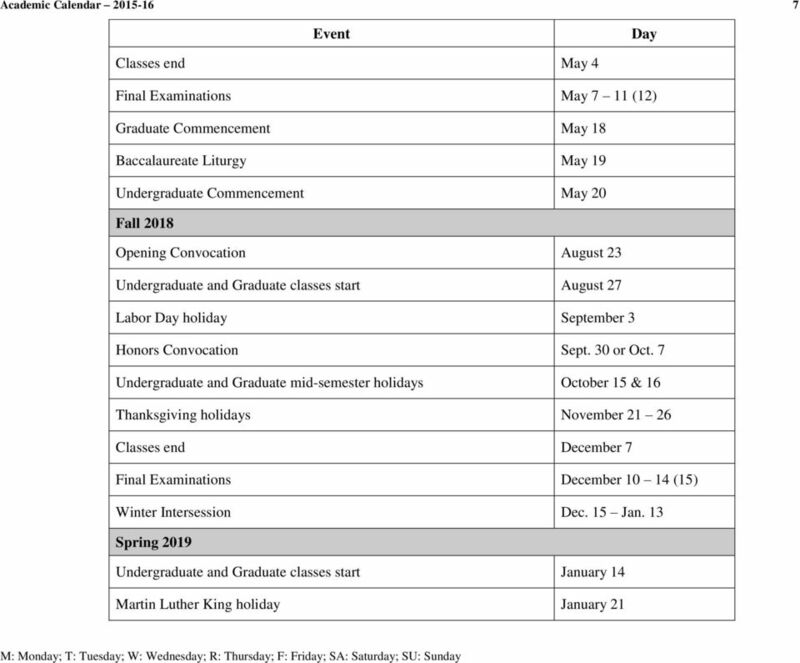 6 Jan 19 Mar 4 Last day for filing P/F option January 29 (F) January 29 (F) Mid-Semester Holiday Mar (M SU) Mar (M SU) Mar (M SU) Registration for Summer classes begins March 14 (M) March 14 (M) March 14 (M) Break dates vary for accelerated programs Mid-semester grades due March 14 (M) RN-BSN II Mar. 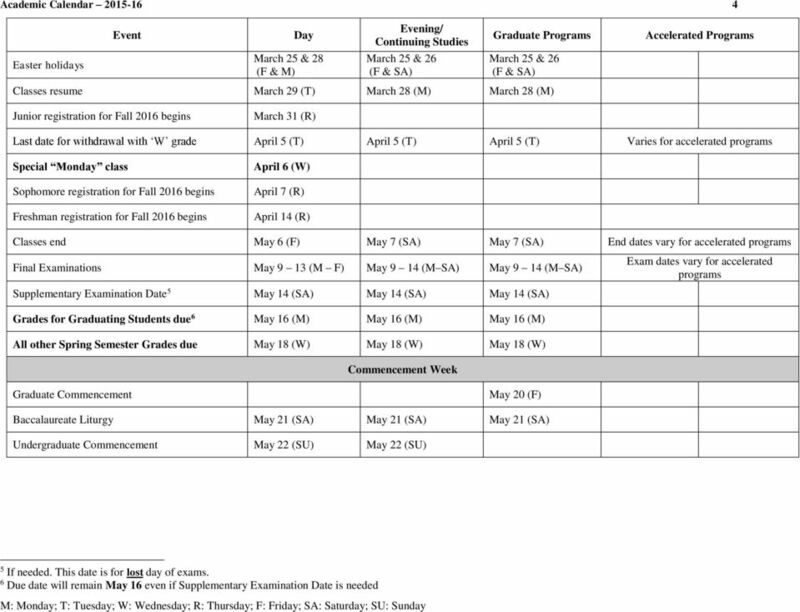 14 May 1 Mar 14 Apr 29 La Salle Heritage Week MARCH 17 (R) to 24 (R) 2 If needed. This date is for lost day of exams. 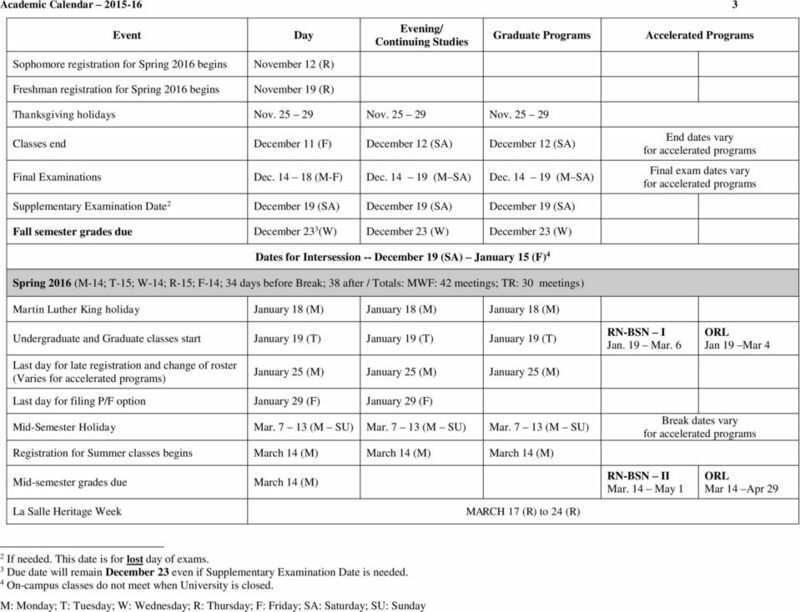 3 Due date will remain December 23 even if Supplementary Examination Date is needed. 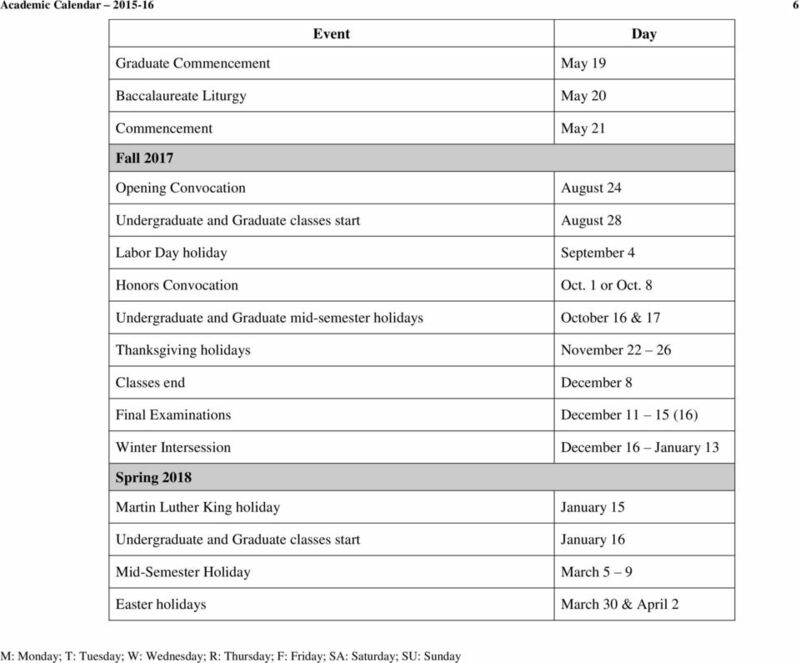 4 On-campus classes do not meet when University is closed.